BCPC Weeds Review 2017 - BCPC British Crop Production Council : BCPC British Crop Production Council . The BCPC Weed Review 2017 focused on alternative options for weed control. A set of talk and case studies was followed by an open debate with the speakers. 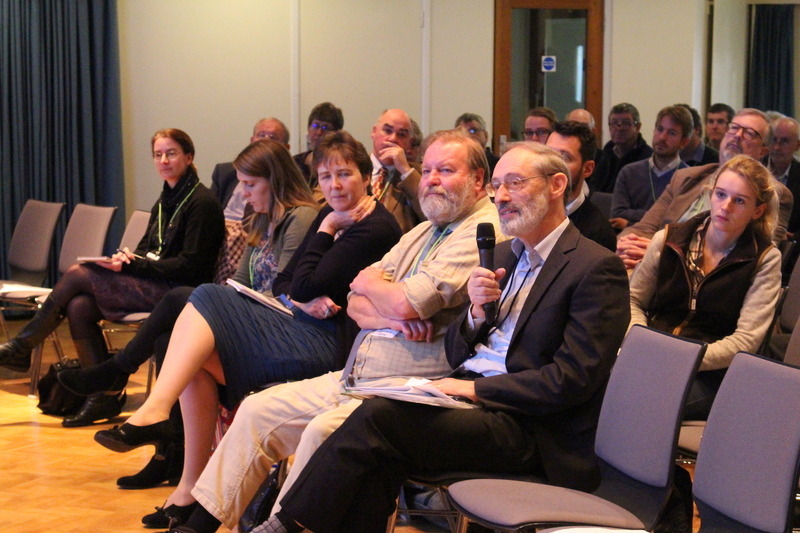 Key topics included: regulatory perspective and future potential losses, the impact on arable and horticultural crops, getting over the challenges and new technologies. Abstract: The review of the weather which starts the conference is included to enable delegates to put subsequent discussions about weed management in 2017 in the context of the prevailing weather last season. Using Met Office data, I will present information primarily on the rainfall and temperatures last season, in relation to the long-term averages. Was it wetter, hotter, colder than normal each month? Peter has spent his career investigating the biology and control of arable weeds, spending his later years at Rothamsted. He has presented information on the season’s weather at most Reviews for at least the last ten years. Abstract: A look at the past and the future of herbicide active substances in the UK. This will include summaries of some of the losses of active substances to the UK, an overview of some of the most affected crops and some of the reasons behind these losses. Alongside the loss of active substances, however, there are many advances in technology which may help use existing active substances in different ways. The talk will explore some of the regulatory questions and challenges surrounding some of these technologies? Ingrid is currently Senior Herbicide and Plant Growth Regulator specialist within the Efficacy section of the Chemicals Regulation Division. She has over 27 years’ experience in agriculture and associated specialisms, having graduated in 1989 from Imperial College (Wye) with a BSc in Agriculture. Since then she has worked in ADAS, MAFF and Defra before joining CRD (then PSD) in 2003. She is responsible for the evaluation of efficacy data in support of plant protection product approvals/authorisations and also provides advice, with particular regard to herbicide issues, to industry, Government Departments and other organisations. She is a member of several EPPO panels and the UK Weed Resistance Action Group. Abstract: Frontier has developed a long term rotational project looking at reducing black-grass population in arable crops. The project has looked at rotations, cultivations and drilling date on a heavy land site. Winter and spring cropping regimes have been compared. The presentation will highlight some of the cost implications of taking some more novel approaches and also demonstrate the long term effects on black-grass population. Christine is currently a Research and Technical Manager with Frontier. She has over 25 years experience in field trials and agronomy and also involved in the family farm. Christine is both a FACTS and BASIS examiner. 11.15 Horticultural Perspective; Successful technology – Andy Richardson, Allium and Brassica Centre. Abstract: Horticultural crops rely heavily on ‘older’ herbicides for effective weed control. With some of these commonly used actives over 50 years old, supporting their re-registration through recent changes in EU Regulations is a considerable challenge! A challenge which many agrochemical manufacturers cannot justify as costly data requirements set against the potential sales, mean the economics simply don’t add up. The ultimate result is that there has been a significant loss of herbicides in horticulture over the past 15 years. Increasing growing costs and diminishing returns mean that conventional herbicides are still widely used in most outdoor horticultural crops, after all they are relatively cheap and largely effective. However, recent approval losses have taken a toll and as a result growers are now more receptive than ever to alternative methods of weed control. This presentation will look through the range of existing and new technologies available to growers as well as looking at ways to better use the herbicide armoury that we have left. Abstract: The Thanet Weed Project was setup to examine the feasibility of alternative weed control in an urban hard surface environment. The treatment types were divided into non-chemical, chemical and integrated and considered the cost benefit, carbon footprint and whole life cycle environmental impacts. The project ran for five years from 2010-15 and culminated with the publication of guidance for the UK Amenity Sector. LanGuard were the contractor tasked with completing the contract, so I can only concentrate on our perspective as the contractor and our experience with alternative weed control since the guidance was produced. Alisdair has been working in the UK Industrial & Amenity sector for nearly 30 years. He started working in product development carrying out and managing field trials, before moving into a technical support role and then Sales & Marketing. In 2004 he moved into the contracting business joining LanGuard Ltd and becoming the Development Director in 2007. He has held BASIS qualifications since the early 1990s and is an Examiner in his specialist areas. 5 minute presentations covering technology, sustainability, economics, extension/viability in broad acre crops followed by a debate and questions from the floor.